Lying close to the north coast of France and bathed by the warm waters of the Gulf Stream, Guernsey is a perfect escape for anyone looking for a tranquil holiday. Truly British but with a very distinct French flair, Guernsey is a place with a real sense of community, where people really take time to smile and say 'good morning'. With an area of just 25 square miles, the coastline of Guernsey is a setting for sandy beaches and dunes, secret coves and rock pools, rugged harbours and endless beautiful cliff walks; Guernsey's environment will reinvigorate your senses. Savour the scent of cool, wooded valleys, or the sight of a sunset mirrored in the Atlantic Ocean or soak up the sound of waves lapping on old granite landing steps, the island is the ultimate natural antidote to stress. Guernsey is a very special place for lovers of flowers and gardens with 449 flowering plants recorded in January alone, the islands are in bloom all year round. Guernsey's capital St. Peter Port is the most beautiful towns of the Channel Islands with a captivating blend of styles, framed by a tumble of terraces and tiered gardens and criss-crossed by worn steps and hidden alleys. Shopping in St Peter Port is an unmissable experience with low duty buys and small boutiques selling exclusive clothes, leather goods, jewellery as well as some exquisite antiques. Indulge in an unforgettable meal with Guernsey offering everything from traditional locally caught fish and chips to fabulous creations involving local lobster and crab that would silence even the most tricky food critic. Guernsey pubs are a great place to be in winter too where you can find roaring log fires, and hearty local specialities including the famous bean jar and Sark lamb casserole. History buffs are spoiled for choice as Guernsey offers the chance to visit pre-historic sites like the Les Fouillages burial mound, possibly the oldest man made structure in Europe and tombs, Pagan priory ruins and museums depicting the island's experience during World War 2 (the Channel Isles were the only part of Great Britain occupied by the Germans). Guernsey is also a great hub for departures by sea and air to the beautiful islands of Herm, Sark & Alderney to experience Island hopping in the English Channel. Guernsey's Ferry port located at St. Peter port offers a number of facilities and is also easily accessible from various directions of the island. 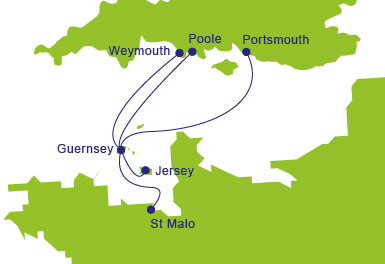 There are connections to Poole Portsmouth and Weymouth in England, to St. Malo and Normandy region in France along with connections to the other Channel Islands. Guernsey's St. Peter port offers facilities such as a cafeteria open for all departures, a newsagent, baby changing facilities, bureau de change, pay phones, disabled assistance and an ATM in the town centre. A car park for short and long stay within walking distance from the terminal. By Car, continue straight over the roundabout from St. Julians Avenue and follow signs to the ferry port. By Train, there are no trains in Guernsey. By Coach, nearest bus stop to the ferry terminal is 5 minutes walk away in the town centre.